In July, Seattle passed a law making it the nation’s second jurisdiction to require law enforcement agencies to seek community approval before acquiring surveillance technology. Santa Clara County in California, which encompasses most of Silicon Valley, pioneered this reform in spring 2016 before similar proposals later spread across the country. Two other jurisdictions in the San Francisco Bay Area—the cities of Oakland and Berkeley—have conducted multiple public hearings on proposed reforms to require community control. Both cities are nearing decision points for local legislators who in 2018 will consider whether to empower themselves and their constituents, or whether instead to allow secrecy and unaccountability to continue unfettered. Other communities across California have also mobilized. In addition to Oakland and Berkeley, EFF has supported proposed reforms in Palo Alto and before the Bay Area Rapid Transit Board, and also addressed communities seeking similar measures in Davis, Humboldt County (where a local group in the Electronic Frontier Alliance hosted two public forums in March and another in December), and Santa Cruz (where local activists began a long running local dialog in 2016). Reflecting this interest from across the state, the California State Senate approved a measure, S.B. 21, which would have applied the transparency and community control principles of the Santa Clara County ordinance to hundreds of law enforcement agencies across the state. While the measure was successful before the state Senate, and also cleared two committees in the State Assembly, it died without a vote in the state Assembly’s appropriations committee. While S.B. 21 was not enacted in 2017, we anticipate similar measures advancing in communities across California in 2018. In many other states, municipal bodies have already begun considering analogous policies. 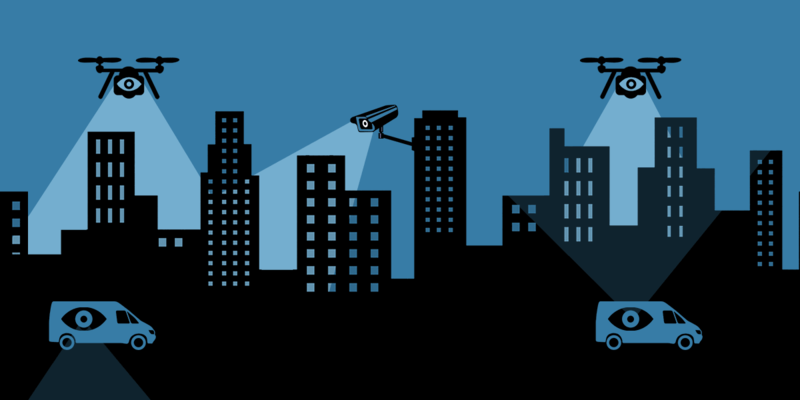 In New York City, over a dozen council members have supported the Public Oversight of Surveillance Technology (POST) Act, which would require transparency before the New York Police Department acquires new surveillance technology. This is an important step forward, though without reform elements that, in Santa Clara County and Seattle, have placed communities in control over police surveillance. The support of local policymakers may help bring to the public debate underlying facts about the proposed reform which appear to have escaped figures who oppose it, including Mayor Bill de Blasio. In the Midwest, Missouri has emerged as a potentially crucial state in the nationwide battle over surveillance technology. Years after grassroots opposition to police violence vaulted the town of Ferguson to international recognition, St. Louis city policymakers introduced B.B. 66, a measure modeled closely on Santa Clara County’s. While the Missouri state legislature has yet to consider a similar proposal, it did consider—without yet adopting—another proposed reform to limit law enforcement surveillance. In particular, S.B. 84 would have limited the parameters under which state and local police could deploy cell-site simulators, which use cell phone networks to track a user’s location or monitor data or voice transmissions. This is just one of many invasive surveillance platforms available to law enforcement. Nearby states have also taken notice of cell-site simulators. Illinois has already enacted a strong law constraining the use of those particular tools, while Nebraska considered a bill that would have prohibited police from using cell-site simulators at all. This established support for limiting one surveillance tool across the region suggests potential traction for process reforms, like Seattle’s and Santa Clara County’s, that would apply to all platforms. The fight against unaccountable secret government surveillance will continue across the United States in 2018. While Congress has yet to enact legislation this year protecting the American people from NSA surveillance, local and state legislatures are heeding the call to conduct effective oversight and to empower the communities they represent.